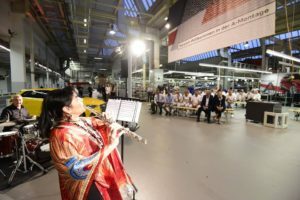 In the last week of September I was sent to Germany by the state of Puebla as their official musical representative and to give a concert in the AUDI Factory in Ingolstadt. Puebla is one of my favorite states (and one of my favorite cities) and I have been giving concerts there for more than thirty years. This time they asked me to take my trio, Trio Amistad, which includes Edgar Ibarra (piano), David Rosas (bass) and Salvador Merchand (drums). Lic. Octavio Ferrer from the Puebla Cultural Institute accompanied us for the trip. We got to spend five days in Ingolstadt and on the day gave two concerts – one in the factory and one in a club within the factory complex – where more than 44,000 Audi employees work!! They were two extraordinary concerts in quite unique settings. I had imagined the the factory would be noisy, dirty and like factories had seen in the movies – but it was incredibly clean, quiet and more like a hospital than a factory. Whilst we were rehearsing, cars were passing overhead for the next stage in their production but whilst we were playing all production was stopped and when the concert was broadcast all over the factory complex there was no noise whatsoever in the factory – apart from enthusiastic applause at the end of each number! This was Flauta Sin Fronteras at its best! After that we went to a nightclub setting and continued for another couple of hours. The audiences were very enthusiastic and even included some Audi employees from Puebla who were training. When we played La Bamba they all got up and danced! 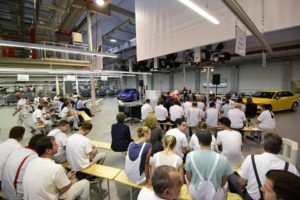 The following day, 30th September, the new Audi Factory in Puebla was formally inaugurated – it will make their top of the line luxury SUVs for the global market. One of my oldest friends, Gisela Goedeke from Munich came to stay with us for a few days and it was great to catch up with her. On the way back to Mexico we met with my teacher and great friend András Adorjan for dinner at Munich Airport (recently voted one of the top ten airports in the world)! We had a wonderful dinner and caught up on András’ latest news, including some of his recent recordings which include his performances of the Schumann concertos for violin and cello played on the flute! Of course he is very much looking forward to returning to play in Mexico and we are hoping he will be back soon. 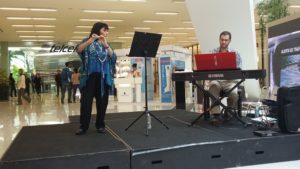 We travelled back to Mexico, arriving at 4am on 1st October and the following day Edgar and I gave a concert for ISSSTE at the Centro Cultural Mexicano Contemporaneo in Centro Historico. I thought that I was hard done by – but Edgar had several performances of Mentiras in addition to our concert and David had a concert with Edith Marquéz in Pachuca four hours after he touched down at Mexico City Airport! It is always good to play with dedicated in-demand musicians who are at the top of their game! My next concert, on Saturday 8th, was also for ISSSTE in their jewel of a concert hall Foro José Solé in Tlalpan. This used to be a chapel and now it is a small concert hall with exceptional acoustics – I would love to present a series of concerts there and I also hope to record there since there is no traffic noise and the acoustics are ideal. 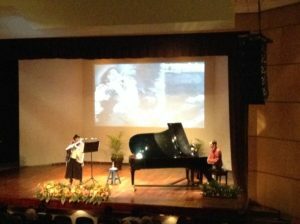 The following weekend we were in Mérida to present PEDRO MI AMOR with Edgar in the Centro Cultural Olimpo as part of the FIC MAYA Festival. I love playing in Mérida because the audiences are so friendly – and because I always get to ‘hang out’ with Joaquín Melo and his family. Joaquín is an outstanding flute player and is principal flute of the Yucatan Symphony. I also enjoy going to Mérida because I have a lot of family members there whom I only get to see when I play there! The evening before my concert we attended the opening of a wonderful exhibition of paintings by our friend Martha Chapa: a really fantastic experience. After Mérida I was able to get back into my practice routine, working on my programs for 2017. These include a Bach Concerto program with violinist Sebastian Kwapisz and pianist Carlos Salmerón, a Mozart-Beethoven program including the gorgeous Beethoven Serenade for flute, violin and viola and most exciting of all, a Schubert-Kreisler program in which I will be playing the arpeggione sonata on the alto flute – it will be a big blow but it is the instrument which best mirror’s the register of the arpeggione for which the sonata was written. The month ended for me with a concert in Plaza Carso on Saturday 29th and the day before Michael and I attended a very special event: the wedding of Julieta Cedillo and Julio Briseño. We have known Julie since she was a young girl and have admired her as one of the best flute players and teachers in Mexico and we have known Julio, principal trombone with the City of Mexico Philharmonic for the last decade or so. It was a beautiful ceremony and it was very special to be included. At the moment I am also working on my José Alfredo Jiménez program which I will be playing with Edgar in Dolores Hidalgo next month as part of the José Alfredo Festival. Two years ago we premiered the program in José Alfredo’s birthplace which is now a museum but this year we are scheduled to play in the Zocolo. Edgar is a very gifted musician who is not only a versatile pianist but is also a talented arranger and made the arrangements of José Alfredo’s most popular songs for me. I don’t know another pianist in Mexico who can transition between classical, jazz, pop, musicals and Mexican music with such ease. I have enjoyed working with him over the last four years and I am looking forward to our next projects together. The key is that we have worked so much together that we have a very solid foundation so whenever we play together we just “click”. Throughout all this period – indeed for many (too many?) months now we have been preoccupied by the American elections which will be taking place in a few days time. As an artist I try to refrain from taking a public position on political matters since we have to work with whoever is in power – and I have played for Presidents and high ranking political figures in Mexico, the USA and in England (well, in England, of course, the Queen!) Recently someone asked me if I still believed that I should play for the American President no matter who was elected and I had to confess that I had only one exception – Donald Trump! So my first and only political declaration is to say that I hope and pray that Hillary Clinton is our next American President! I took my vote to the US Embassy his week and I will be glued to the TV next Tuesday evening!